This book represents the first collection of research on health social movements. Demonstrates that health social movements are an innovative and powerful form of political action. Brings together the study of health and illness with social movement theory in order to establish a basis for the study of health social movements. Covers disease-based movements focused on diseases such as Alzheimer’s and breast cancer. Also addresses issue-based movements such as the pro-choice movement, the movement for complementary and alternative medicine, and movements around stem cell research. Illustrates the value of interdisciplinary approaches to studying health social movements. Phil Brown is Professor of Sociology and Environmental Studies at Brown University. He is the author of No Safe Place: Toxic Waste, Leukemia, and Community Action (1990) and co-editor of Illness and the Environment: A Reader in Contested Medicine (2000). Stephen Zavestoski is Assistant Professor of Sociology at the University of San Francisco. His work has appeared in journals such as Science, Technology and Human Values, Journal of Health and Social Behavior, Sociology of Health and Illness, Social Science Computer Review, and Organization and Environment. 1. 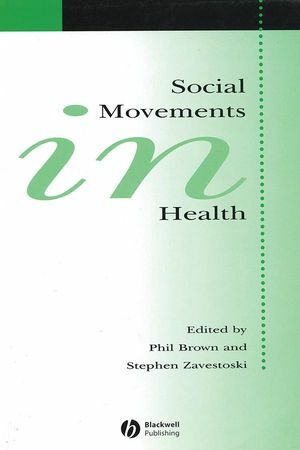 Social Movements in Health: An Introduction: Phil Brown and Stephen Zavestoski. 2. Medical Modernisation, Scientific Research Fields and the Epistemic Politics of Health Social Movements: David Hess. 3. The Dynamic Interplay Between Western Medicine and Complimentary and Alternative Medicine Movement: Melinda Goldner. 4. Health COnsumer Groups: A New Social Movement? : Judith Alsop, Kathryn Jones, and Rob Baggott. 5. Regenerating Movements: Embryonic Stem Cells, Social Movements, and the Politics of Potentiality: Chris Ganchoff. 6. Uneasy Allies: Pro-choice Physicians, Feminist Health Activists, and the Struggle for Abortion Rights: Carole Joffe and Tracy Weitz. 7. Advocating Voice: Organisational, Historical and Social Milieux of the Alzheimer’s Disease Movement: Renee Beard. 8. Framing as a Cultural Resource in Health Social Movements: Funding Activism and the Breast Cancer Movement in the US 1990-1993: Emily Kolker. 9. Breast Cancer in Two Regimes: The Impact of Social Movements on Illness Experience: Maren Klawiter. The first collection of research on health social movements.